Facsimile folders are a first step to get acquainted with the facsimile editions published by Quaternio Editions Lucerne. They take the viewer on an educational journey to the wonderful world of medieval and Renaissance imagery. As collectables they are available independently of the editions. Preparing for and accompanying each facsimile edition, a high-quality documentation folder is published by Quaternio Editions Lucerne. It contains a facsimile double leaf or two to three single facsimile leaves which give the viewer a sense of the aura that the fascinating centuries-old originals have about them. Marvel at the precious pigments and the often finely tooled gold and silver areas reproduced with great attention to detail, and admire the utmost care which has been taken to attain the highest standards! Only as a result of the enormous amount of time and effort put into the → production are you able to experience every single facsimile leaf as if it were the original one. An integral part of every facsimile folder is a richly illustrated 16-page brochure presenting the essential background information on the specific manuscript being published as a facsimile. This brochure sheds light on the historical circumstances affecting the royal, noble or clerical patrons of the manuscript, as well as on the manuscript’s often intricate journey through the centuries from the past to the present. Art historians describe the particular conditions which pertained in the period of origin, and also explain the characteristic features of the book illuminator, or even of an entire workshop operated by one or several masters. In addition, accompanied by illustrations, the brochure provides useful information on the main steps of facsimile production. The facsimile folders can of course be purchased independently of the editions. They are highly treasured by bibliophile collectors. Every folder is hand-made, linen-bound and decoratively tooled in gold or colour. When you acquire the facsimile leaves, which are reproduced true to the original, your home is suffused with the magic of the most beautiful manuscripts of a historical era, representative of the great medieval book art. When you place an order for the facsimile edition, the corresponding facsimile folder will be sent to you immediately, free of charge. 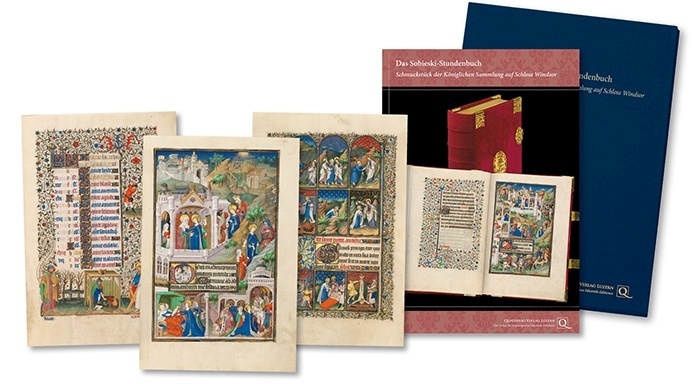 The facsimile folders issued by Quaternio Editions Lucerne offer a very special access to illuminated manuscripts. They open a window on the brilliant worlds recorded on images from the past, thus giving the viewer a step-by-step survey of European book illumination, ranging from the Carolingian period to the Renaissance. Taken together, the facsimile leaves from the various folders compose a magnificent pictorial kaleidoscope covering seven centuries. This is a rare opportunity to experience the impressive variety of medieval book illumination! The folder pertaining to a particular manuscript is described on the page of the respective facsimile edition. 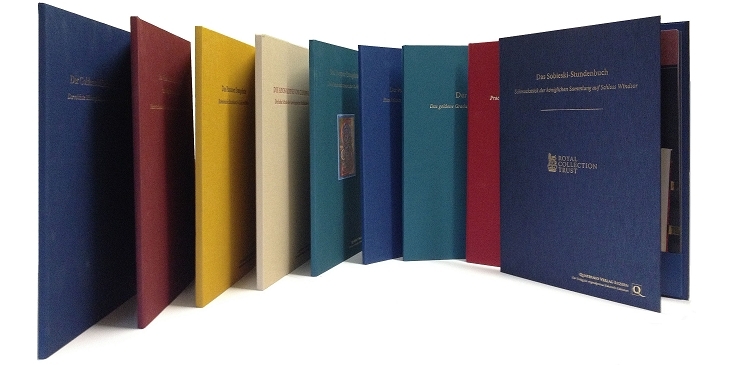 Click here to go to the online shop (German only) where you can order the facsimile folders. Or send us an email to info@quaternio.ch. Do you have any questions about the facsimile folders? Please do not hesitate to contact us. We are looking forward to your message.